The quality of our taijutsu depends on strong foundations. But what does taijutsu and foundation really mean? Taijutsu is often understood as the sole body movement but when you are used to Hatsumi sensei’s vision of life it is always interesting to dig a little deeper and see what the word(s) really encompass it is necessary to review the various writings and meanings of the words. First 術 jutsu is either art, means, or technique as we know but this is with the various meanings of tai that we have subtle changes in the understanding of the word taijutsu. But when you look at the three meaning of “tai” you discover that they can be applied to your training. 体, tai has 3 main meanings: 1: body; physique; posture. 2: shape; form; style. 3: substance; identity; reality. Taijutsu is a jutsu done with the body that goes from the pure omote (body) to enter the world of ura (reality). This is integrating the taigamae (体構え) and the kokorogamae (心構え). This is a self centered taijutsu. 対, this other tai expands our understanding of taijutsu by precising that it is also: 1: opposite; opposition. 2: versus; vs. 3: equal footing; equal terms. 4: against …; anti-. This new taijutsu is expanding and adds the idea of fighting the enemy and to balance the forces of the opponent. Now we are into the man to man fight. 隊, this last one means: party; company; body (of troops); or corps. Now taijutsu expands again and includes the idea of army fighting and to interact with our friends and our enemies. The interesting thing here is that by digging through the various understanding of “tai” we moved from the apprentice training where we are alone; to the encounter with a single opponent; to the battlefield feeling. So taijutsu a general system to prepare our bodies and mind to go from the beginner to the advanced level. Our foundations are based on the quality of the basics that we learn alone and then with a partner through years of training. Taijutsu help us to grow from the omote to finally reach the essence of the ura. In Japanese 大本 is the kanji for foundation. It reads either “taihon” (taihen?) or “ômote” (omote?). Maybe this is how we must understand sensei when he speaks of 実践 jissen (practice; practise; put into practice) and 実戦 jissen (combat; actual fighting). On a practical aspect we have to keep in mind what sensei has repeated many times concerning the densho. “densho are for kids (beginners)” as techniques have to be taught step by step. Historically the young samurai would begin his warrior training at around 10 years of age and at 15 years of age would become an adult and be allowed to go to the battlefield. In fact, the 15 ranks in the bujinkan were created by sensei also to symbolize this. When you begin you are a beginner and then after many years you reach adulthood and become responsible of your own actions, you are jûgodan. But without good basics your taijutsu will lack credibility. Therefore our training in the three tai defined earlier will guide us in our mastering of taijutsu. 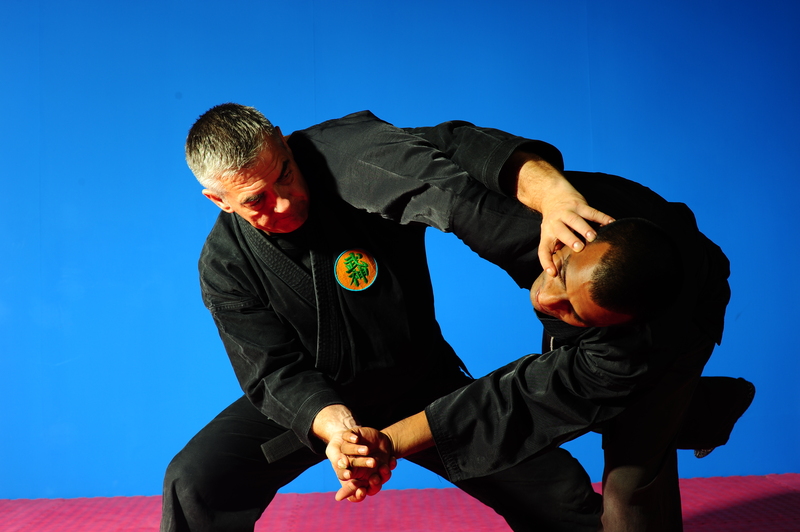 We will move gradually from taijutsu (体術) to taijutsu (隊術) which included the use of yoroi and weapons. The first tai (body) is the modern translation for the word but in the past tai encompassed also the mind, the weapons and the yoroi. If you think about it, it is quite logical. As we said earlier, young samurai (mostly kids) were not able to understand the subtleties of high level techniques including weapons. So in order to keep it K.I.S.S. (Keep It Simple & Stupid) the trainers striped the techniques off the weapons and began to teach unarmed combat only. This is why we begin our training with unarmed combat. On the battlefield warriors would always carry weapons and unarmed combat would be rarely used. The foundation of our taijutsu is a set of basics acquired in unarmed combat and regrouped by sensei in the tenchijin ryaku no maki in 1983. Once mastered, unarmed taijutsu is completed with all the usual weapons of the samurai and the yoroi to create a natural flow of movement. This is why taijutsu (体術) is the true foundation of taijutsu (隊術). I find this an interesting way of looking at the meaning behind Taijutsu, but I also find it interesting that now we have people who progress through the grading system so fast and with so little experience that the 15th rank is often given/awarded to people who have not trained and do not train except when there is a chance of being promoted by some of the higher Dan grade teachers. Does this mean that the ranking system has gone wrong?